Just a bunch of booze here. No date on bottle - 2015 batch? Deep brown to black with a marginal.amount of head that settles to a couple bubbles and an incomplete ring. Minimal lacing on a sip. Nose is strong booze, rum, and molasses. Taste follows the nose with rum, booze, molasses, vanilla, smoke, and oak. Mouthful is medium to heavy and smooth. Carbonation is average to low. Finish is a tad warming and dry. This is a really solid beer (and I am not a rum afficionado). The molasses is a really nice backbone from stem to stern here as it accentuates the rum, the barrel, the nose, and taste. Having had the Barbados variety (and enjoying it), I would take this any day over that bottle just due to the nice balance. This is the original May 2015 batch, one of only 140 bottles, so let's try and taste the rare, shall we? The pour looks like any other aged Monster's Park variant, of which there are many--deep brown and relatively viscous, with a thin sliver of head that leaves a slight bit of lacing behind. Smells strong and rich, with blackstrap molasses, barrel oak, dark fudge, and a hint of black cherry. A flavor bomb on the palate, with big roasted grains, chocolate, barrel character, and enough sweetness from the rum to balance out the roasted bitterness of the base stout. Modern Times goes all in on their vanilla variants, but if this was from another brewery, I could easily be convinced that it was aged with vanilla added. At 13%, there is a fair amount of heat in the rum notes, along with an impression of some spice from the moderately-high carbonation. For those still hoarding your bottle, I did not detect any noticeable signs of oxidation, so this appears to be ageing well and should last for the years to come. That said, I do not regret for one second popping mine open on a random Friday evening and drinking it at its current age; this is phenomenal stuff. Another incredibly tasty version of MP. 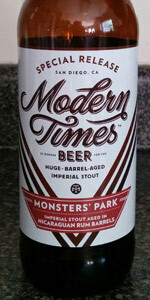 As with the bourbon barrel MPs, I find the beer doesn't need any additional additives. There's enough vanilla, coffee and chocolate in there as is!